Croft Preservation is a family-run damp proofing company, fixing damp problems for commercial and residential customers across Dorset & Hampshire. We specialise in a wide range of building and damp treatment services, including damp proofing, wet rot, dry rot and woodworm treatments, property extensions, renovations and basement waterproofing. Whatever type of damp problem or building work you are facing, our experienced and friendly team are here to help you achieve the best results for the best price. Don’t hesitate to contact our team of builders and damp experts today on 01202 737739 to discuss your requirements and request a quote. Why choose us as your local building and damp repair experts? Established back in 1985, our excellent reputation across Dorset and Hampshire has consistently grown thanks to the high-quality of work we complete for our clients, both on time and within budget. 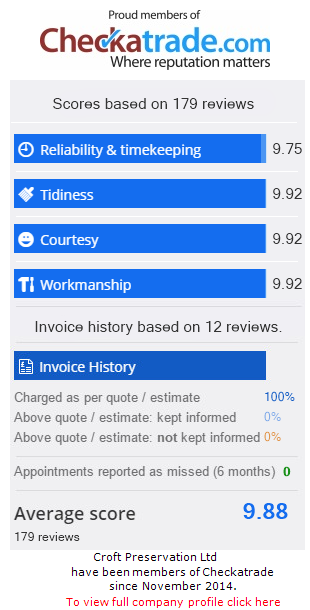 We have over 130 positive reviews on Checkatrade.com! We’ve grown our business over the years by putting our customers are the heart of everything we do, ensuring you receive damp proofing and building services that are cost-effective and delivered on time and within budget. We understand that having any stranger in your home can be daunting, but our team of property maintenance experts will put your mind totally at ease. We pride ourselves on our customer service and take the time to explain everything in detail and keep you fully informed of any work being carried out in your property. With over 30 years of industry experience, our team is perfectly positioned to help customers across Dorset and Hampshire with a variety of damp solutions and building works. Don't hesitate to contact us today on 01202 737739. Contact our building and damp specialists in Poole today! If you call our office with a damp issue, you can feel confident that our highly skilled team will be able to identify the problem and recommend a cost-effective, reliable solution that works for you. There is no pushy sales pitch or search for work that just isn’t there – Croft Preservation employees are honest, hard-working and trustworthy in all they do. Croft Preservation are different to many other companies in that we tailor all our services to the needs of each individual client, meaning every project is different and the customer continues to come first. Our technical teams are fully qualified and trained to deliver the exceptionally high-quality work our customers have come to expect, so you can enjoy peace of mind knowing that Croft will always deliver. Contact us for a professional property or damp survey today on 01202 737739 – you won’t find a more friendly or thorough service anywhere else in Dorset or Hampshire.